In honor of the DC Jazz Festival and our own Jazz ‘n Families Fun Days this weekend, here are some works in the collection to get your toes tapping, all of which relate to jazz. Can you see it? 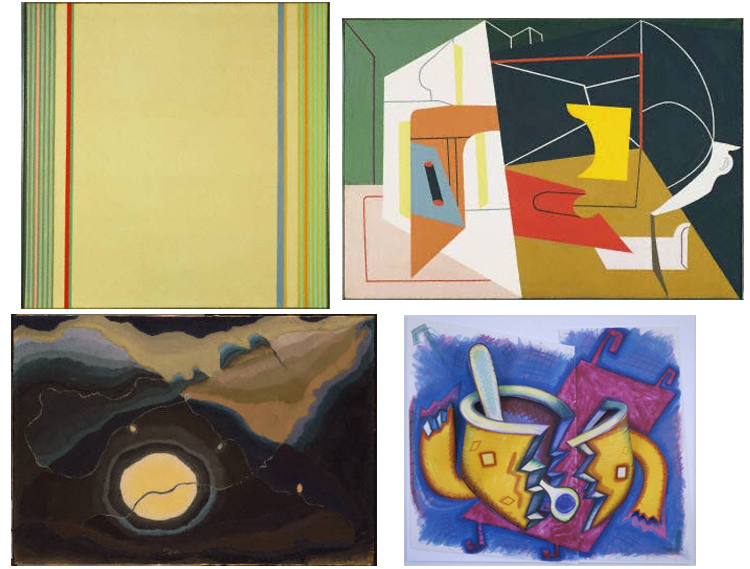 Clockwise from top left: Gene Davis, Jasmine Jumper, 1966, Acrylic on canvas 119 1/2 x 161 1/2 in. ; 303.53 x 410.21 cm.. Gift of Florence Coulson Davis In Memory of Gene Davis, 1992. Stuart Davis, Egg Beater No. 4, 1928, Oil on canvas 27 1/8 x 38 1/4 in. ; 68.8975 x 97.155 cm.. Acquired 1939. Elizabeth Murray, Jazz, 2001, 3-dimensional lithograph, Edition 7 of 46 overall: 30 in x 34 in x 4 in; 76.2 cm x 86.36 cm x 10.2 cm. Purchased with funds from the estate of Nathan and Jeanette Miller, 2007. Arthur G., Dove, Me and the Moon, 1937, Wax emulsion on canvas 18 x 26 in. ; 45.72 x 66.04 cm.. Acquired 1939. The Phillips Collection, Washington DC. Gene Davis said, in a 1975 interview, “My work is mainly about intervals, that is, like in music. Music is essentially time interval, and I’m interested in space interval.” He was also known to say that he painted “by eye” the way a jazz musician plays “by ear”. Stuart Davis collected jazz records that he played while he worked, replaying them much as he repeated visual elements in his paintings. His daily calendars chronicle purchases of new albums and when he played them. Elizabeth Murray captures the vibrant sound and broken branches of jazz improvisation in her colorful print, Jazz (2001). And Arthur Dove’s Me and the Moon (1937) is named after the 1936 song which he heard on the radio while he worked. What visual art makes you think of jazz? What Happened to that Negative? The image that Intersections artist Vesna Pavlović created with the deteriorated 8 x 10 negative from the museum archives is mysterious and fascinating to look at. But what happened to it? 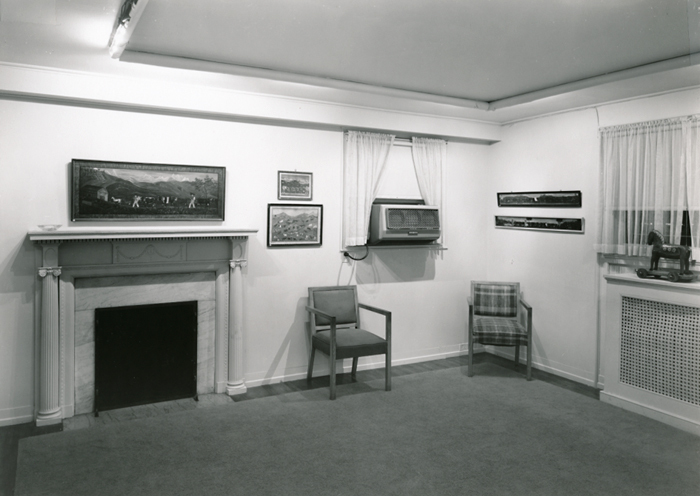 The installation shots of the Phillips’s 1957 show, Swiss Peasant Art, were taken using large format cellulose triacetate sheet film or safety film (so called because it was less flammable than the previously available nitrate film.) The film captured clear, detailed images but over time the acetate film base shrunk, pulling away from the emulsion and causing bubbles and an effect called channeling. Thankfully, the archives has a full set of 8 x 10 contact prints (created by sandwiching photographic paper and the negative, generating a print the same size as the negative and preserving detail). 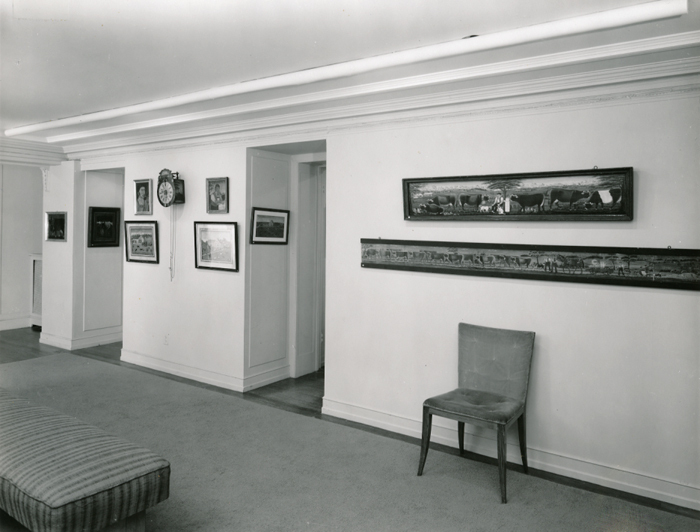 Swiss Peasant Art exhibition at the Phillips, June 9-July 2, 1957. This is the print from the deteriorated negative adapted by Vesna Pavlović. Photo: The Phillips Collection Archives, Washington DC. Swiss Peasant Art might seem like an unusual show for the Phillips, and it was. Organized by the Smithsonian Institution Traveling Exhibition Services—or SITES—the show was called “one of the most heartwarming exhibitions to be seen in Washington in a long time” in a review from The Washington Post. The objects were selected from Appenzell and Toggenburg and focused on the ceremony of Alpenaufzug, the annual upward trek of herds to the springtime mountain pastures. The show included paintings, wooden milk pails, cut brass, a clock, and other decorative items. Swiss Peasant Art exhibition at the Phillips, June 9-July 2, 1957. Photo: The Phillips Collection Archives, Washington DC.